Corinne began working at North Star in 1976 as a paste-up artist, a job that no longer exists in today's publishing world. She has worked as an editor, book designer, illustrator, and is now the owner of the press and senior editor. She is also a writer with eighteen books completed and many more in the works and is a visual artist, specializing in botanical illustration. "In some form or other, books have been my life, and North Star is still my biggest focus. Retire? Not in the foreseeable future." Curtis has been with North Star since May of 2012, starting with shipping and receiving. In February of 2014 he took over as Business Manager and is excited about continuing his education in the publishing world and continuing North Star's long tradition of publishing great regional authors. He has been, at various times in his life, a commercial fisherman, contractor, organic farmer, research chemist, and a sailor. 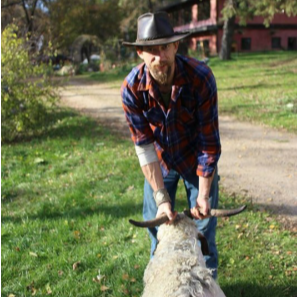 He and his wife Liz operate Dancing the Land Farm on Liz's family land in Stearns County (on the same property as North Star Press), where they raise veggies, flowers, chickens, ducks, goats, sheep, pigs, and a multitude of cats and dogs.